Good morning and welcome to World Markets Live. Here are the opening calls for European markets. A volatile ride for U.S. stocks, as Donald Trump Junior releases his email exchange with a Russian lawyer, which sparks a temporary sell-off, while the Euro hits its highest level against the dollar in more than 14 months. 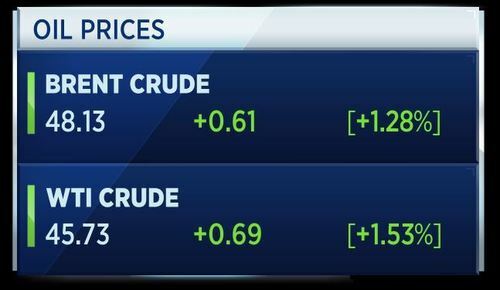 Oil prices trade solidly higher as the market awaits the OPEC report. A report cites panic at Apple as the tech giant scrambles to fix last minute software bugs affecting the iPhone 8, which is expected to be released in September. 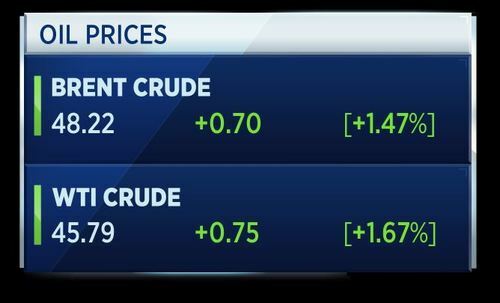 Oil prices extended gains after the U.S. government's Energy Information Agency announced on Tuesday that U.S. crude oil inventories fell by 8.1 million barrels to 495.6 million in the week to July 7. It also lowered its expectations for U.S. oil output in 2018. It expects 2018 crude oil output to rise to 9.9 million barrels per day (bpd) from 9.3 million bpd this year, a 570,000 bpd increase. This was down from last month's forecast 680,000 bpd year-over-year increase. Meanwhile, the market is looking ahead to the latest monthly OPEC report released today, which will provide an outlook for the crude oil market. Donald Trump Junior has released the emails that preceded his meeting with a Russian lawyer last year. The exchanges show he believed he was going to get damaging information about Hillary Clinton, as "part of Russia and its government's support" for the Trump campaign. The U.S. Senate has announced a two-week delay to its usual August recess. 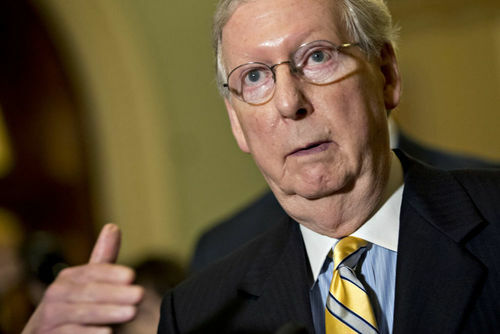 Senate Republican leader Mitch McConnell (pictured) says the move allows senators more time to work on legislation and approving nominees. They may seek a vote on a controversial healthcare overhaul bill as soon as next week. Oil has been trading up, following news from the States. The Energy Information Agency cut its production forecast for next year, while API data showed a large drawdown in inventories. 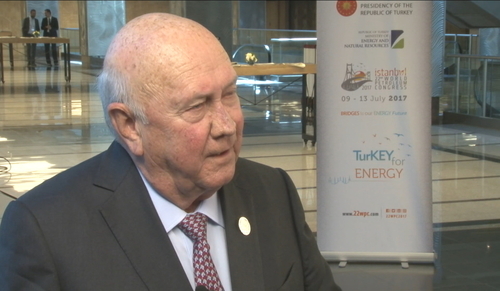 Reporting from the World Petroleum Congress in Istanbul, CNBC’s Steve Sedgwick spoke to Frederik Willem de Klerk, former president of South Africa during the apartheid era, about misappropriation and land seizures in South Africa. The constitution effectively protects land security, home ownership and shared ownership security. As long as the constitution is not amended and it cannot be amended easily, there is securtity in that regard. The voices we hear about taking land without compensation is from extremist wings. It's been rejected even by the ANC even in its disarray, in clear terms that they don't stand for expropriation of land without compensation. My message to investors is the legal system and constitutional system in South Africa does safeguard you, and what we are hearing at the moment is extremist catching the headlines but that's not what is in essence within the law and in the hearts and minds of a majority of South Africans in play. 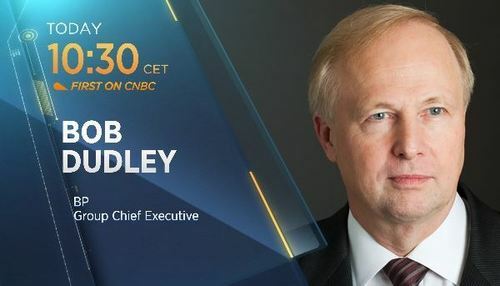 Coming up, CNBC will speak to Bob Dudley, CEO of BP, later this morning. 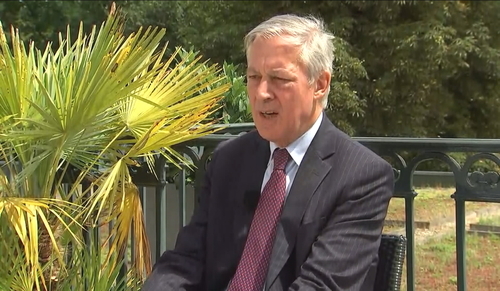 Speaking to CNBC at the Europlace conference, the former governor of the Bank of France Christian Noyer said Paris can replace London as Europe's top financial centre after Brexit. What I see is that the vast majority of institutions if not all are planning to put in Paris their trading room. Why? Because market activities require high skilled staff and Paris is both a city where you can attract those high skilled people, not only because the city is nice, but because it’s a big city like London. It’s the only big city like London. Amazon says its 'Prime Day' is on course to be the online retailer's biggest on record by sales. Customers ordered more than 3 times as many echo speakers, while third party sellers had shipped over 50 times more items by noon local time. Prime Day was the first major test for the Amazon Prime Air fleet. The company introduced the cargo service last summer and has being spending billions of dollars on building its own logistics network. Barratt Developments reports total completions including joint ventures at 17,395, compared to 17,319 last year. This is the highest level in nine years. Profit before tax is expected to increase to around £765 million from £682.3 million last year, ahead of expectations. The total average selling price on completions increased by around 5.9 percent to circa £275,000. It expects to deliver on its financial targets set in 2014. The competition watchdog says it is referring the proposed Tesco-Booker merger for an in-depth investigation. The watchdog says in more than 350 local areas there is currently an overlap between Tesco shops and Booker-supplied stores, meaning shoppers could face worse terms when buying groceries. Federal Reserve governor Lael Brainard says the Fed is likely to begin reducing its $4.5 trillion balance sheet soon. Her comment comes ahead of Janet Yellen's two-day Congressional Testimony on Capitol Hill. 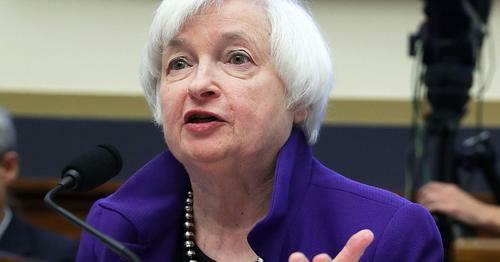 US lawmakers are likely to grill her on the Fed's tapering plans and its interest rate outlook. 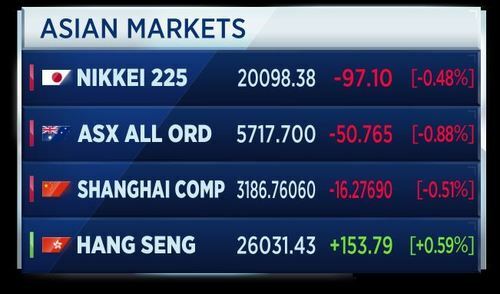 Asian shares are mixed in the overnight session. 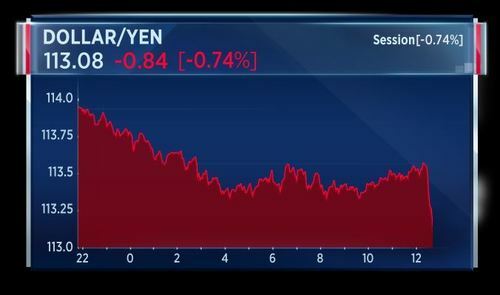 The Nikkei slid on gains in the yen. Investors are looking ahead to comments from Federal Reserve Chair Janet Yellen, as she is set to testify before congress. South Korea's GS Galtex announces it has bought total of 3 million of U.S. crude for August to October. Oil prices remain up on reduced U.S. inventories and a lower production outlook for 2018. 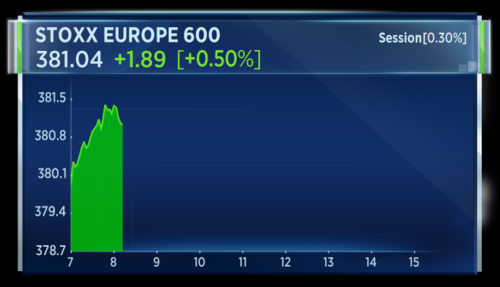 European markets are open for Wednesday's session, moving higher. 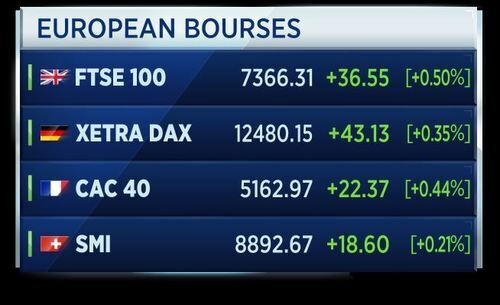 The major individual European bourses have open up higher this morning. These are the stocks pulling the STOXX 600 higher. Norway's DNB is near the top on strong earnings data. 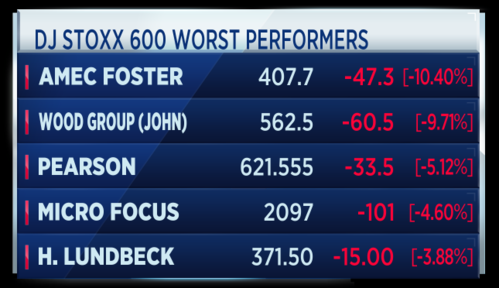 At the bottom of the index, Pearson continues yesterday's slide and John Wood Group is near the bottom following news that its acquisition target Amec Foster Wheeler is being investigated by the Serious Fraud Office. 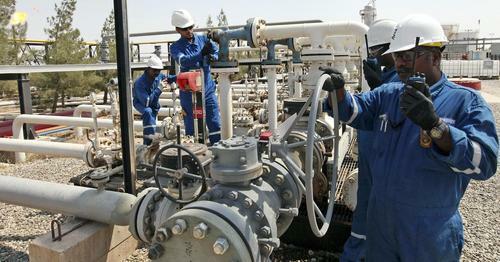 Saudi Arabia is to cut oil shipments to customers by more than 600,000 barrels per day in August due to an increase in demand at home, according to Reuters citing a Saudi industry source. August oil exports will fall to their lowest level this year at 6.6 million barrels per day. Exports to the U.S. will fall below 800,000 barrels per day. Saudi Arabia is keen to see an improvement in the oil market and accelerate rebalancing, according to the source. Saudi Arabia will work closely with other producers to stabilise the market by making sure production cuts continue. Bank of England Deputy Governor Ben Broadbent says he's not ready to raise interest rates. In an interview with the Scottish Press and Journal newspaper, Broadbent said it was "too tricky to make a decision" just yet. He cited a nervous mood among businesses as one reason why he was wary of pulling the trigger on rates. 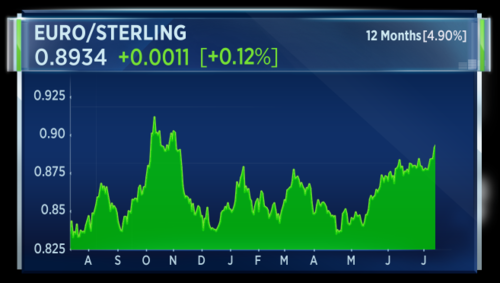 Broadbent's comments caused sterling to drop against the dollar. 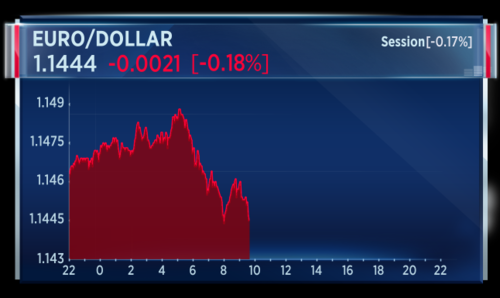 The pound is trading down 0.2 percent against the U.S. currency. That will tick up the price of egg and chips for those British holidaymakers as they bask in the sun. Speaking at the World Petroleum Congress in Istanbul, Iran's deputy oil minister says Iran expects to reach oil output of 4 million barrels per day by the end of 2017. He says it is too early to discuss OPEC cuts. The minister says the country is not short of customers for its crude. 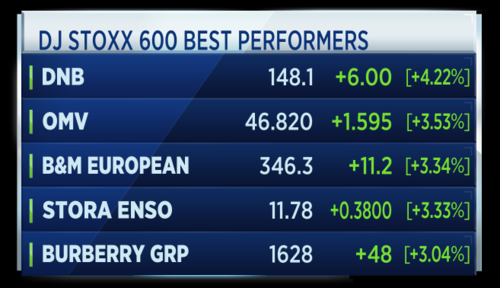 Here's how European markets are performing one hour into Wednesday trade. 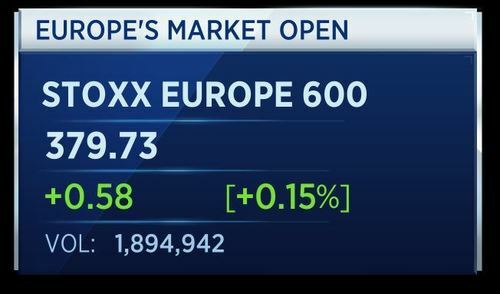 The pan-European Stoxx 600 index is up 0.57 percent. Here are the best and worst performers across Europe. Perhaps the standout news this morning is that of biggest faller, Amec. The oil services and construction firm is being investigated by the UK Serious Fraud Office over suspected corruption and bribery. On average though, it is a positive morning for Europe's bigger listed stocks with an aggregate of the top 600 rising by 0.5 percent. The U.K. unemployment rate has dropped to 4.5 percent, the lowest level since 1975. The ILO jobless figure fell 64,000 to a total of 1.495 million in the 3 months to May. Sterling has risen on the news. 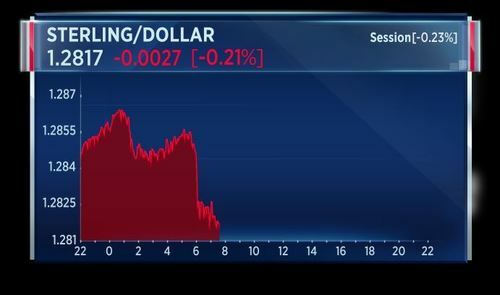 Sterling rebounds on UK jobs data. June's adjusted jobless claimants rose +6,000. The negative news came in the form of depressed real income for U.K. householders with inflation reaching a 4 year high of 2.9 percent in May, which translated that pay in the three months to May fell 0.7 percent. That would mark the steepest fall since mid-2014. Bob Dudley the CEO of BP is live on air with Steve at the World Petroleum Congress in Istanbul. To me it means balance on a daily basis between production and demand is equal and that is the case. It is just that the market is focusing on the high levels of inventories. Dudley says there is a school of thought that price spikes could occur as there an investment gap appearing from the Oil & Gas sector. He says as much as $2 trillion dollars may have been deferred in production. Dudley is planning BP budget at around $50 per barrel. On the U.S./Russia relationship he says it is hard to penetrate the news and get a clears sense of what it means for firms such as BP. The euro zone industrial output for May has come in at +1.3 percent month on month and +4.0 percent higher year-on-year. That above forecasts of 0.8 and 3.6 percent respectively. 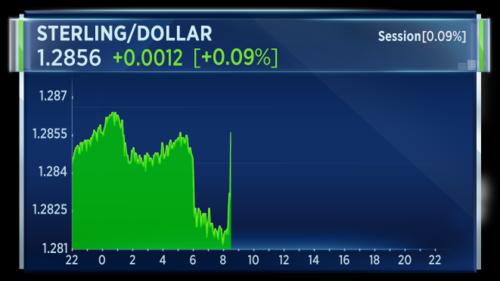 The euro-dollar pair as it was at 10:40 a.m. BST. Royal Dutch Shell is to sell assets in Ireland for as much at $1.2 billion. 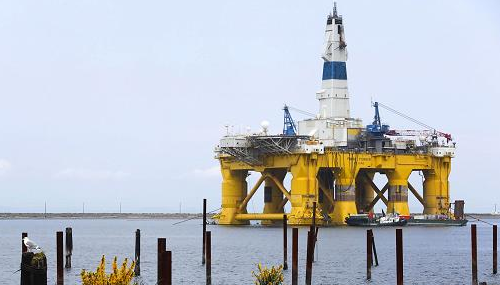 Through Shell Overseas Holdings the energy firm has reached agreement with Canada Pension Plan Investment Board unit to sell shares in Shell E&P Ireland. Shell E&P Ireland holds a 45% interest in the Corrib Gas Venture. expected to complete in the second quarter of 2018. Shell says it will retain a presence in Ireland through Aviation JV, Shell and Topaz Aviation Ireland Limited. 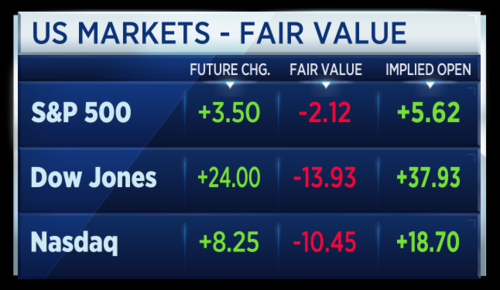 U.S. markets look set for a mildly positive open later. 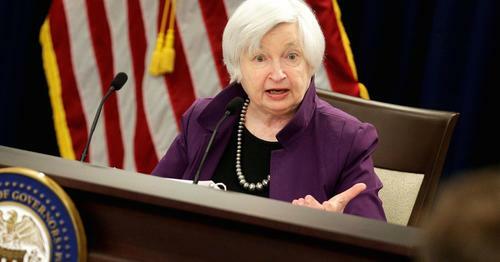 Wednesday will see The Federal Reserve Chair Janet Yellen address Congress with her Monetary Policy Report. The Bank of Canada is also set to announce its latest interest rate decision and investors will watch to see if U.S. markets respond further to the release of Donald Trump Jr.'s emails. Donald Trump has said on Twitter that his son "did a good job last night". This amid mounting pressure over a meeting Trump Jr. attended with a Russian lawyer in the belief she would hand over damaging information on Hillary Clinton. CNBCOPEC's oil output rose in June, driven by increases in Libya and Nigeria and as Saudi Arabia reported it pumped above its quota. 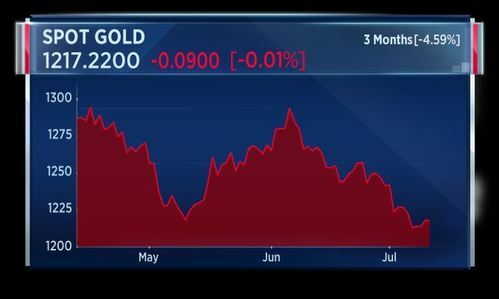 Gold steadied on Wednesday, holding above this week's near four-month low ahead of a closely watched speech by U.S. Federal Reserve Chair Janet Yellen later in the day. Investors will be watching Yellen's semi-annual monetary policy testimony before Congress for clues on the Fed's attitude towards inflation, and on when the U.S. central bank will start reducing its $4.5 trillion balance sheet. French interior minister says France wants to work with Britain on re-negotiating 'Le Touquet' border controls agreement. That's according to Reuters. 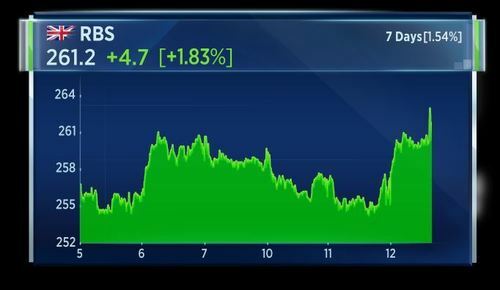 U.S. markets are called higher today, ahead of the market open due in an hour and a half. 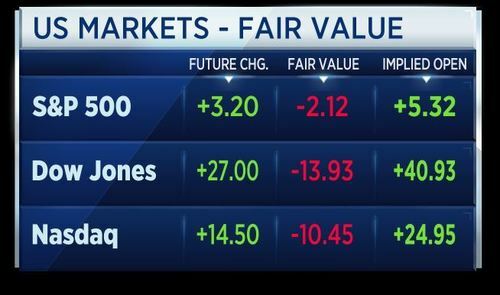 Future values predict the Dow will open about 40 points higher, the S&P 5 points up and the Nasdaq to gain around 24 points. This after a mixed session yesterday when Donald Trump Jr. sparked a market sell-off when he published his email exchange concerning meeting a Russian lawyer in 2016. Market recovered from the sell off but the Dow finished flat and the S&P was down a couple of points. Poland's June net inflation grew 0.8 percent year on year, matching forecasts, according to the country's central bank. Meanwhile, India's consumer price-based food inflation for June fell 2.12 percent year on year, according to the Indian government. Price-based inflation grew 1.54 percent in June year on year, below the 1.7 percent expected. 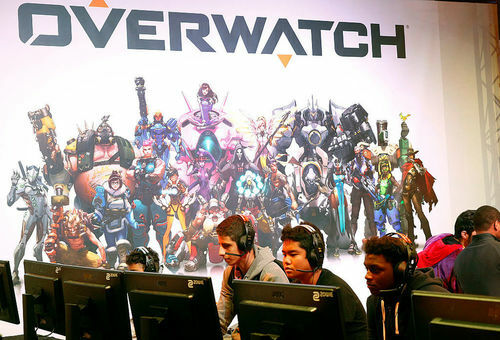 Games company Activision Blizzard has announced the sale of league teams for major global cities for the video game Overwatch, Reuters reports. Activision has spent the last few years developing the e-sports sector, releasing games designed to appeal to e-sport fans and promoting tournaments. The e-sports sector generates huge amounts of revenue by selling tickets, streaming access and merchandise to fans who want to watch e-sport video game tournaments. Overwatch league teams have been announced for Boston, Los Angeles, Miami-Orlando, New York, San Francisco, Seoul and Shanghai. New team owners include Robert Kraft, chairman and CEO of the Kraft Group and the New England Patriots, and Jeff Wilpon, COO of the New York Mets. Overwatch was launched in May 2016 and features teams of characters trying to complete objectives. American Airlines reports record traffic in June. Total revenue passenger miles were 21.0 billion, up 0.8 percent from June last year. It has raised forecasts for its key revenue metric. 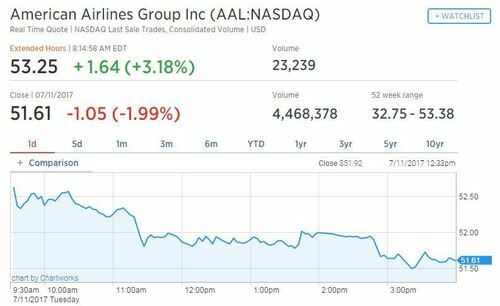 It expects its Q2 total revenue per available seat mile to be up around 5 to 6 percent. 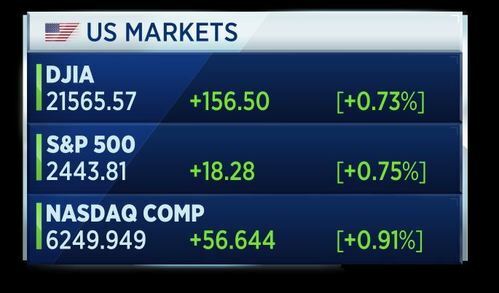 Shares are more than 3 percent higher in premarket trade on the back of the report. Challenger Gray data shows June U.S. CEO turnover jumped nearly 19 percent, Dow Jones reports. 95 CEOs left their posts in June, up 18.7 percent from May, but down 2 percent from a year ago. Federal Reserve Chair Janet Yellen emphasized Wednesday that the central bank is closely watching tepid inflation data but that she still expects to begin shrinking its $4.5 trillion bond portfolio later this year. In prepared remarks for her semiannual testimony Wednesday and Thursday on Capitol Hill, she said that the bond portfolio, or balance sheet, eventually will be "appreciably below" its current level. Last month, central bank officials unveiled their plan for slowly reducing reserves by phasing out reinvestments. EU's Moscovici says prospect of Greece returning to markets is becoming more credible. That's according to Reuters. CNBCFederal Reserve Chair Janet Yellen testifies before the House on the state of the economy.